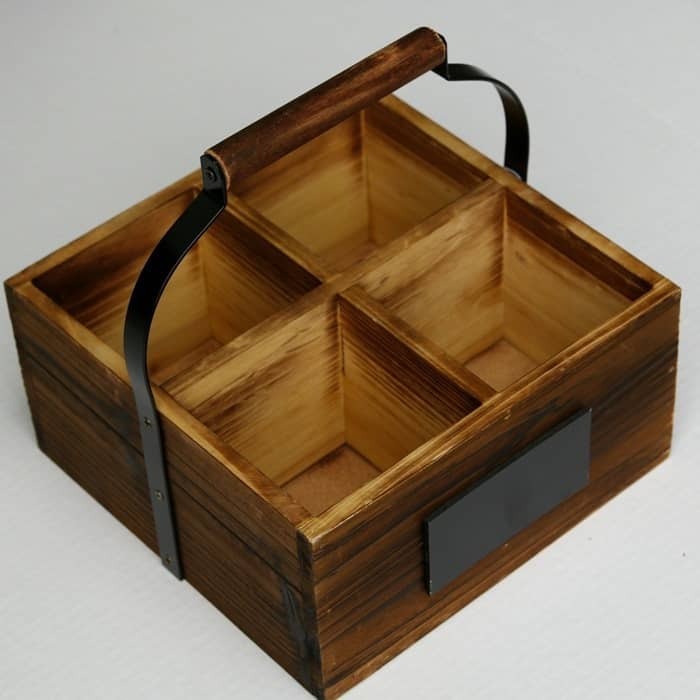 A wood caddy is a work horse…..or a thing of beauty. 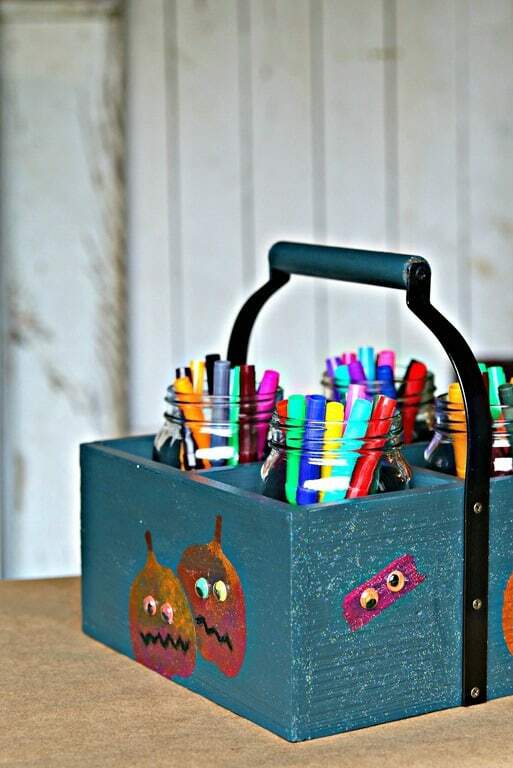 The multi-functional wood caddy I painted is almost too pretty to use for anything other than a display piece. I absolutely love the paint color I selected for the caddy…..Elegant Teal. The color is deep and rich and screams cool days and Fall decorating. I added Ball jars filled with yellow mums to the painted caddy. Pretty. This month my fellow Plaid Creators and I were challenged to create a Friendsgiving Tablescape and my piece of the project is a kids table centerpiece. I added a few fun details to the caddy to make the perfect kids table centerpiece. 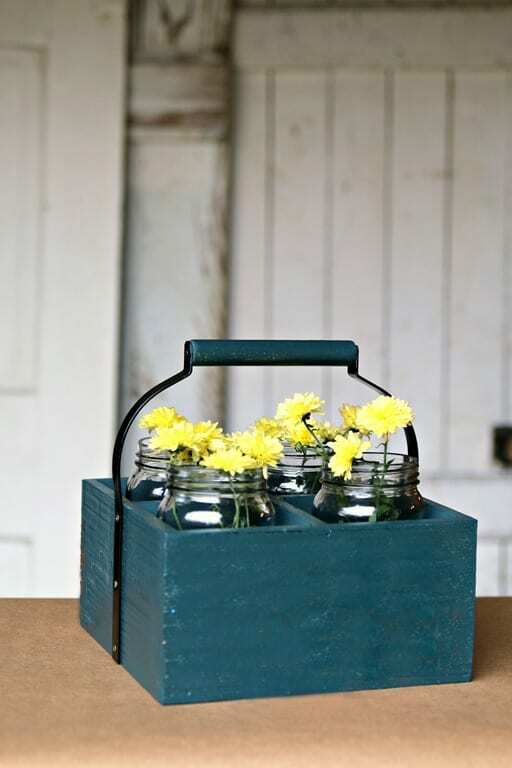 The color of the caddy is Elegant Teal and the paint is FolkArt Home Décor Chalk®. You guys have heard me talk about this paint. It’s my favorite ultra matte chalk finish by far. 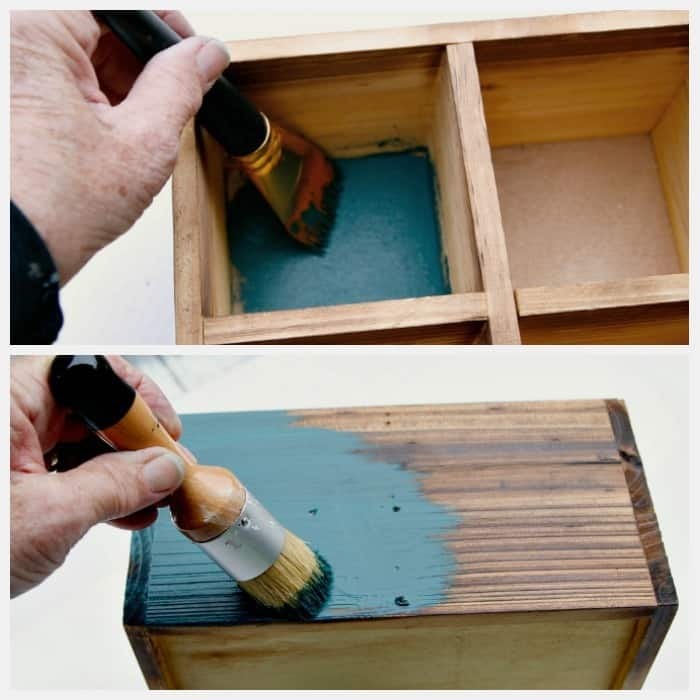 There is no sanding or priming needed with the paint either. Easy. I bought the wood caddy for $5 on clearance at Michaels. I liked the shape, the metal handle, and the size. I didn’t like the dark wood finish and the plate/chalkboard detail on the side. Easy things to fix. I popped off the rectangular tag on the side of the caddy and removed the handle for easier painting. We were given a jewel tone color scheme as a guideline for our projects. The Elegant Teal fit the bill. One reason I love the FolkArt chalk finish is because it layers and distresses so well. But, no distressed paint on this project. Unusual for me I know, but I have a surprise finish in store. I painted the interior of the caddy first. Always work from the inside out. Painting interior areas can be a bit messy but I used a small flat brush on the interior and the painting went smoothly. I used a FolkArt Chalk Brush on the exterior. I think I’ve mentioned before how much I love these brushes. One coat of paint all over did the trick. Pint size Ball jars fit perfectly into the caddy and the yellow mums pop against the color of the caddy.Moving on to making the caddy into a fun centerpiece for the Friendsgiving kids table. 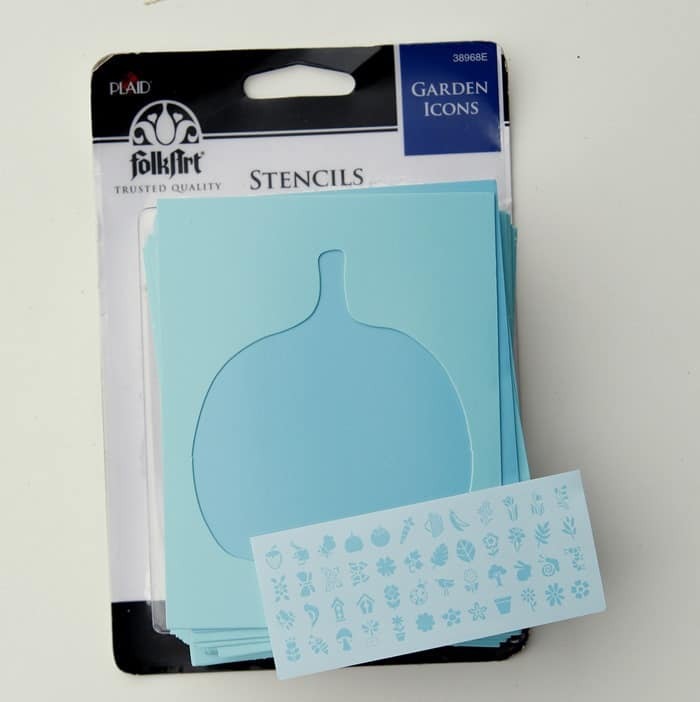 I found a pumpkin stencil in the FolkArt Garden Icon Stencil Pack. It was just the right size. I could probably freehand a pumpkin but why take chances when I have a stencil. 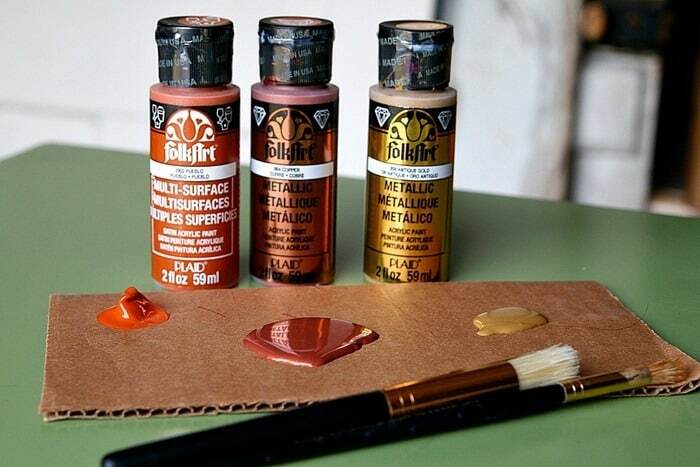 The stencils are made of heavyweight paper and can be used over and over. 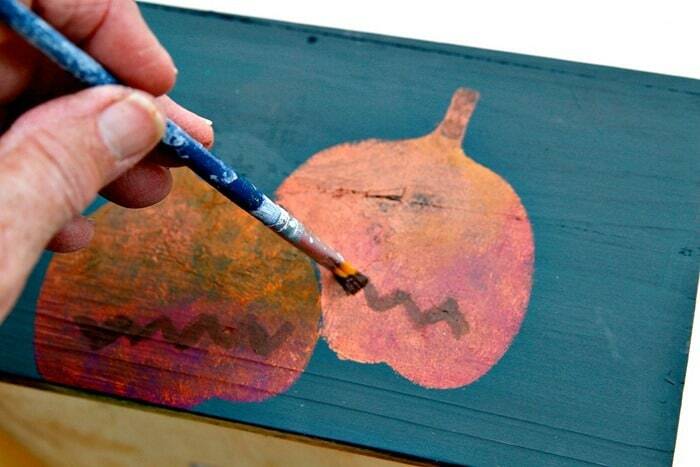 I found two beautiful FolkArt Metallic paint colors and a burnt orange multi-surface acrylic to stencil the pumpkins. 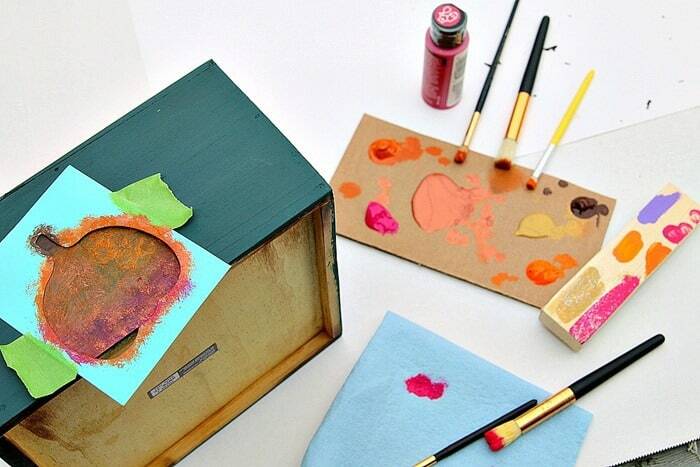 Look at how the small pool of metallic copper in the center of the cardboard shimmers and shines. I love the bold metallic colors. You guys have seen me stencil soooo many times I know you know my secret to stenciling. I use multiple colors to give the stencil depth. It only took about 5 minutes to stencil several pumpkin designs on the painted caddy. I ended up pulling out more paint colors for the pumpkin designs. More colors add more depth to the stencils. I painted color samples on a wood block to preview the colors and also try out a little Sparkle Mod Podge on the paints. 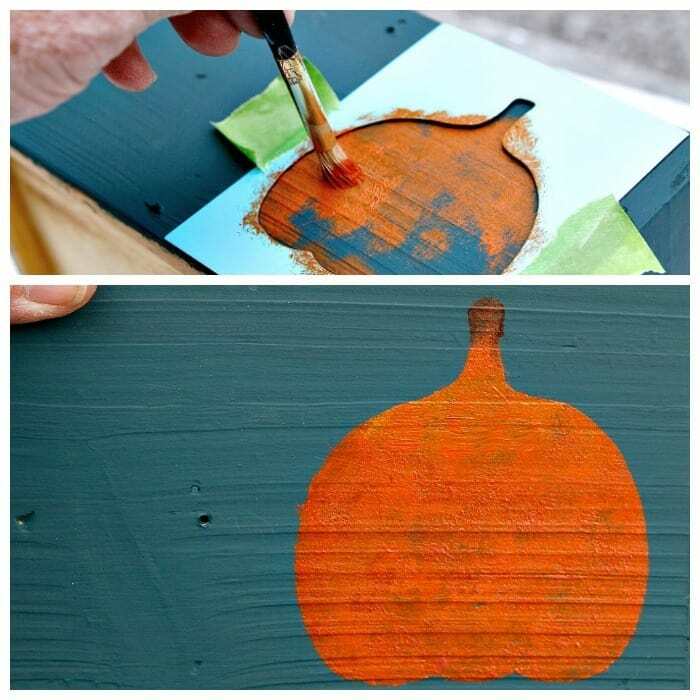 If you aren’t sure about a paint color or technique, try it out on a piece of wood or cardboard before going big with the design. Once the stenciled pumpkins were dry I painted their mouths on with black acrylic paint and a small paint brush. The only thing I can freehand…..zigzag mouths. Now for the fun touches that will make the kids laugh. I brushed Sparkle Mod Podge all over the painted caddy. 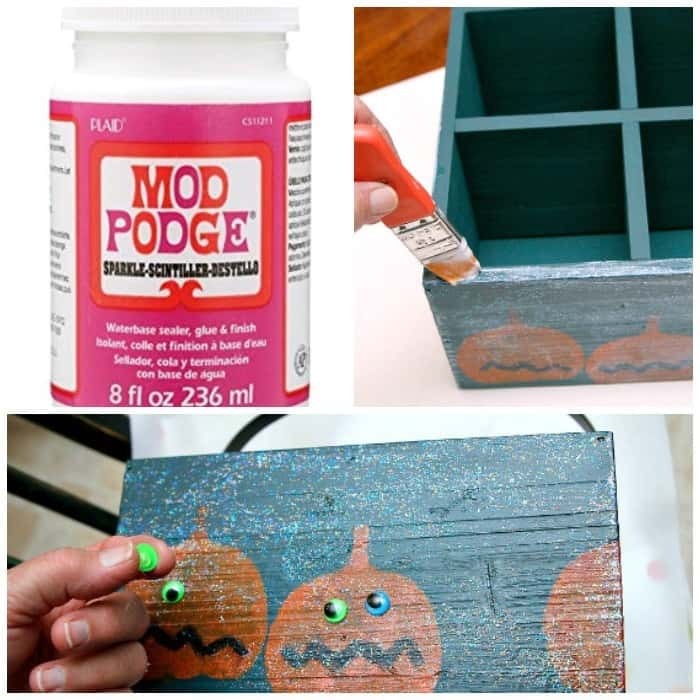 The Sparkle Mod Podge adds a glistening finish and lots of sparkle plus it’s an all-in-one sealer, glue and finish. I used hot glue to add brightly colored googly eyes to the pumpkins. What kid (and me) doesn’t get a kick out of googly eyes. Ta-Dah! Coloring sheet placemats (or simple brown Kraft paper) for the kids table and a whimsical caddy filled with markers. What could be more fun than that. An easy way to keep the kids entertained. The Sparkle Mod Podge doesn’t show up too well in my photos. It just looks white. But trust me, it’s all shimmery and sparkly in person. The Extreme Glitter Mod Podge would work perfectly too. 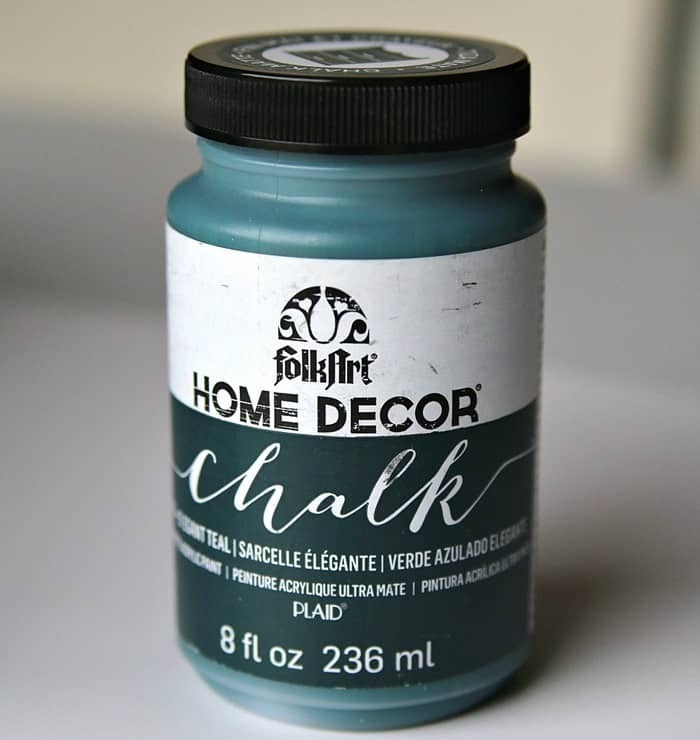 Find the FolkArt Teal Chalk Finish and FolkArt metallic paints on my Amazon page here. For those who aren’t familiar with the term Friendsgiving, it is a large get together/meal with friends held around Thanksgiving. As always, you take something ordinary and make it extraordinary!!! 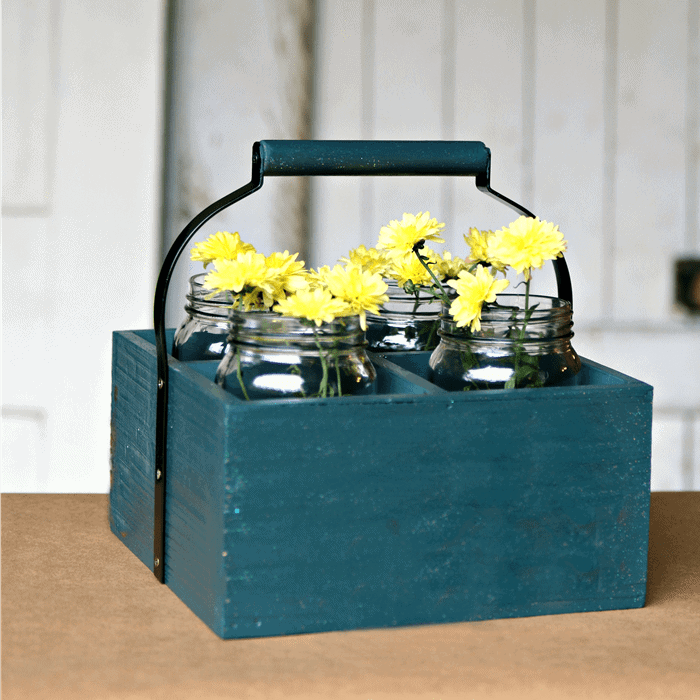 The teal with the yellow mums was very elegant and would be an added touch to any table. 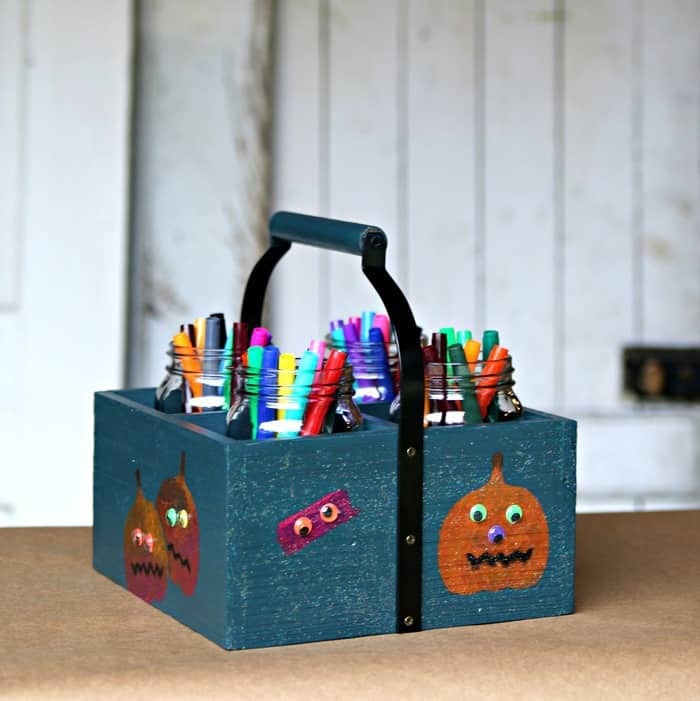 Adding the pumpkins, googly eyes and glitter finish with the markers transforms elegant to fun and whimsical in a heartbeat. Love it.